While searching for additional information about a possible Jewish Family Hasselbacher in Vestenbergsgreuth, I found an additional HUO (Hasselbacher of Unknown Origin)! 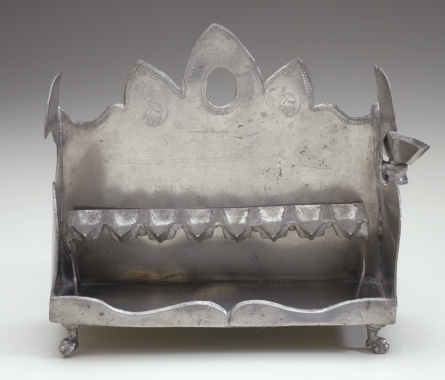 There is a Hanukkah Lamp in the collection of The Jewish Museum of New York City made by the pewter-master Johann Friedrich Hasselbacher of Leutershausen. 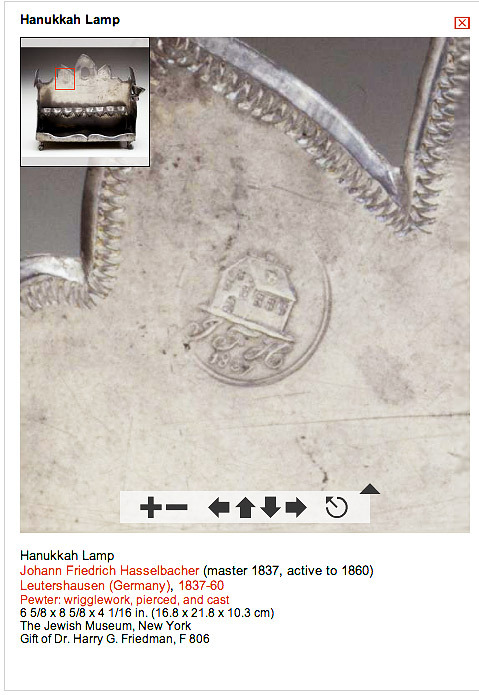 The two images below are screen-shots from the Museum website. Leutershausen is a village just 12 km to the west of Ansbach. A targeted search for Johann Friedrich returns only links to the Jewish Museum. Because their online image was accompanied by a few additional facts, I wrote the the Museum to see what else they might know. Curator Susan L. Braunstein kindly showed me a page from a "standard" (for them!) catalog of German pewter makers and their marks. The entry above is from Erwin Hintze: Die Deutschen Zingeisser und Ihtre Marken, vol. 6: Sueddeutsche Zinngiesser, pt. 2, mark no. 173. 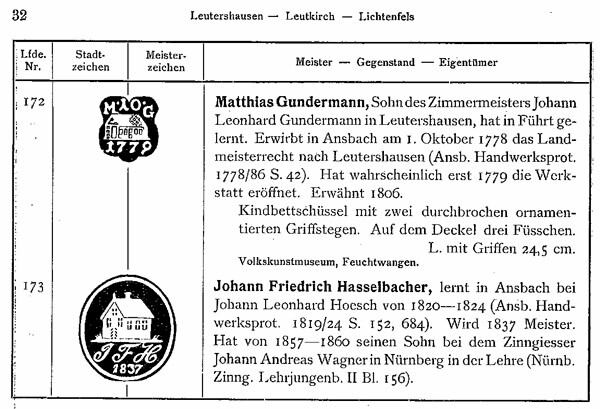 It states states that Johann Friedrich learned the trade of Zinngiesser (tinsmith?) in Ansbach from Johann Leonhard Hoesch from 1820 to 1824, and became a Master in 1837. Additionally, Johann Friedrich had a son who studied in Nürnberg from 1857 to 1860 under the Zinngiesser Johann Andreas Wagner. I also asked about the possiblilty that Johann Friedrich might have been Jewish. This was not considered very likely. Much ceremonial Jewish art was made by Christians within their guild systems. It is suggested that Jewish artisans would have worked outside the guild system and would not have marked their work. 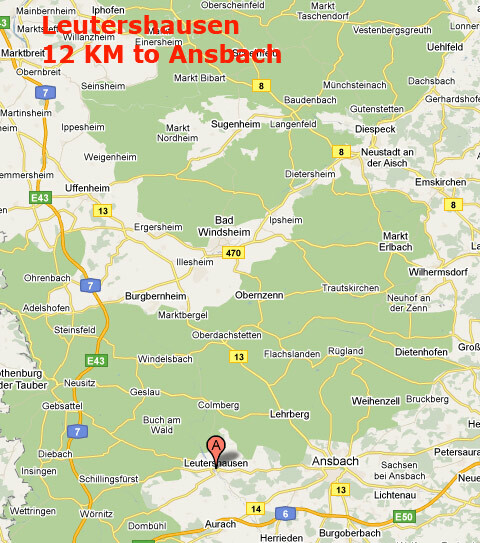 We know that there were Hasselbachers of my family line living in Ansbach by the latter 1700s. We do not know whether Johann Friedrich began life in Ansbach, Leutershausen, Dinkelsbühl, or elsewhere, but it is quite possible that we will be able to find out! It is also possible we can find evidence of his son in Nürnberg. I will start by looking in the House and Street Directories of Nürnberg during my next visit. My Grandfather Konrad Hasselbacher was a toolmaker in the early 1900s, as was his brother Michael. Until recently, I was not aware of any older generation Hasselbacher who worked in the metal crafting trades. I recently found an early 1900s advertisement in Munich for J. Haselbacher who was a dealer in watches and gold. I know nothing more about him. Tracing the occupation is an indirect way to trace the parentage. Perhaps I will get lucky. Last month I visited Leutershausen, Ansbach, and Nürnberg. I was able to solve all of the mysteries above. As it happens, Johann Andreas came from a Christian family and is related to me. His son, Johann Leonhard Hasselbacher, who did indeed train in Nürnberg, became a Zingiesser in Leutershausen. I will present this information in detail later. It was a wonderful visit in which I also found the Jewish Family Hasselbacher. Peter Hasselbacher, 7 Feb 2011; Edited: 27Nov2011. Contact me.